A Gecko named Lucky & Networking with Markus! - Time for a nice cup of tea? A Gecko named Lucky & Networking with Markus! This week I took a chance and brought Markus to an evening apero to celebrate the publication of "Lucky, ein Gecko auf Reisen" (Lucky the Gecko goes travelling , which was written by my friend's husband). 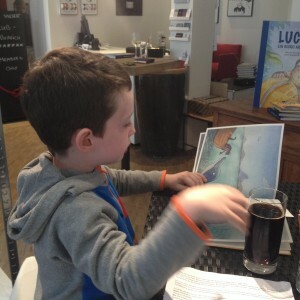 I had sold the event to Markus by telling him that he woudl get to go with Mummy on an adventure to a bookshop, where there would be a reading from a kids book about a Gecko, and he could stay up late. He was sold. But I digress. I was so impressed by my mini Networker. He shook hands with many adults, introduced himself, talked to people in english or swiss german depending. And i looked at him and realized he is growing up fast. He was thrilled to get Coca cola to drink (a BIG treat!) and we read the book together before the actual reading. We bought both the author's books and came home together happy. Markus' last words? "Mummy, that was 10'000 times better than a bookshop! When is the third book about Lucky coming out?" A bookworm and introverted networker after his Mother's heart!